Tonight Ameobi will get another taste of playing on the Continent in United’s final friendly of their German and Austrian tour, with Fenerbahçe the opponents this evening (6.30pm) at the home of SC Ritzing. Long-serving striker Shola Ameobi goes into the Magpies’ upcoming Europa League campaign as United’s second – highest scorer in their 120-game history in Uefa competitions. Ameobi junior watched on as a youngster as Shola found the net regularly in Europe, scoring at places like the Nou Camp against Barcelona no less as part of his haul of a dozen goals. Only Alan Shearer, who has 30, is ahead of Ameobi senior, but his younger sibling Sammy is expected to be unleashed this term. And Sammy revealed his hunger to play on the big stage in Europe. He told The Journal: “It is an honour for me to even play Europa League football as it is with the Premier League. Ameobi has just one Magpies goal to his name so far after scoring a wonder strike at Scunthorpe United in last season’s Carling Cup. And he joked he has his eye on Shola’s record in the all-time scorers’ list, which includes club legends like Bob Moncur, Peter Beardsley, Tino Asprilla, Gary Speed and Rob Lee to name but a few. 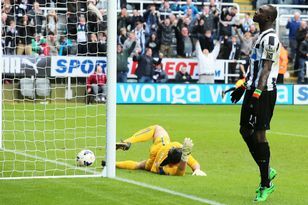 Ameobi junior said: “Shola’s got a great record. I’ll see if I can top that. “He’s got a few years on me so we’ll see if I can catch up to that.” Ameobi has been one of the big plus points for Alan Pardew so far on their European tour. He spent half of last season out with a knee injury sustained in the reserves when trying to maintain match fitness. But after going down after an innocuous challenge against Wigan’s second string, he was forced to miss the second half of the season. Nevertheless, he still watched on with pride as his team-mates sparkled in the Premier League. Ameobi said: “Last season was a great season for us. We have a good chance. “The lads are all together and that honestly does help your performances, because we’re all friends. Meanwhile, Steven Taylor could miss tonight’s game with Fenerbahçe with the player targeting the two games in Portugal next week against Olympiacos and Braga for his return to action. Taylor has been out since last December with a an Achilles problem, but trained with the group yesterday for the first time since being in Germany. WOULD Newcastle United supporters prefer a trophy in the cabinet or a decent league position?